I dedicate this essay to my brother Jacob Phillips, who in training his mind and body for the betterment of himself and for service to his country, is one of the manliest men I know. Homer and Virgil, two of the usual suspects. Pretty soon I’ll be writing up a post called something along the lines of ‘Manly Feminism and Feminist Manliness,’ and it will be an attempt to reconcile two great traditions of gendered moral thought into a coherent and pluralistic whole. I’m expecting it will mostly piss off most feminists, but it will be my olive branch- proof to subsequent generations that I, Luke Phillips, am not a vapid radical ideologist bent on discrediting my rivals, but a reasonable thinker willing to make compromise while standing up for truth as I see it. Now, if you’ve followed my writings or even just glimpsed at a post of mine on Facebook, you will know that I hold Manliness to be the master virtue, a way of life integrating all that is good into a set of firm principles malleable enough to be practiced by any human being in any (manly) walk of life. And if you’ve followed my writings, you will know that I don’t think only human beings above the age of 18 and possessing penises can be Manly; ‘Manliness’ is instead a catch-all term that catches all the virtues and can be caught by anyone of any gender, period. The more politically correct would rather call it virtue or integrity or character or something similar, but these terms cannot do justice to the fullness and integration of all aspects of life which Manliness requires. 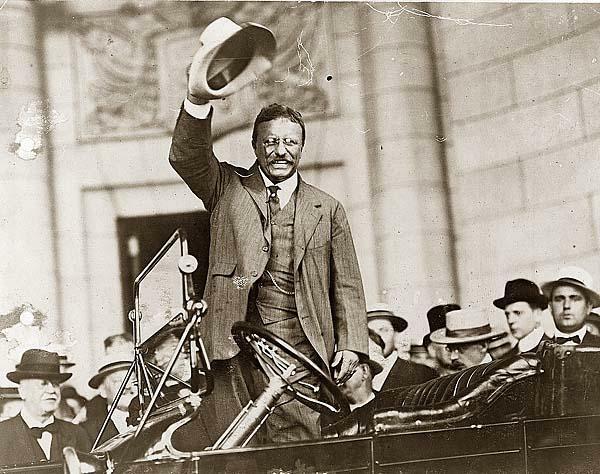 President Theodore Roosevelt, one of the manliest men in American history. “We need, then, the iron qualities that must go with true manhood. We need the positive virtues of resolution, of courage, of indomitable will, of power to do without shrinking the rough work that must always be done, and to persevere through the long days of slow progress or of seeming failure which always come before any final triumph, no matter how brilliant. But we need more than these qualities. This country cannot afford to have its sons [and daughters] less than men [and women]; but neither can it afford to have them other than good men [and women]. If courage and strength and intellect are unaccompanied by the moral purpose, the moral sense, they become merely forms of expression for unscrupulous force and unscrupulous cunning. If the strong man has not in him the lift toward lofty things his strength makes him only a curse to himself and his neighbor. All this is true in private life, and it is no less true in public life. If Washington and Lincoln had not in them the whipcord moral fiber of moral and mental strength, the soul that steels itself to endure disaster unshaken and with grim resolve to wrest victory from defeat, then the one could not have founded, nor the other preserved, our Federal Union. The least touch of flabbiness, of unhealthy softness, in either would have meant ruin for this nation, and therefore the downfall of the proudest hope of Mankind. But it is no less true that had either been influenced by self-seeking ambition, by callous disregard of others, by contempt for the moral law, he would have dashed us down into the black gulf of failure. Woe to all of us as a people if ever we grow to condone evil because it is successful. We can no more afford to lose social and civic decency and honesty than we can afford to lose the qualities of courage and strength. It is the merest truism to say that the nation rests upon the individual, upon the family- upon individual manliness and womanliness, using the words in their widest and fullest meaning. But where does this Manliness come from? The Art of Manliness (an excellent blog, basically a blog for Boy Scouts who never grew up, because it basically takes what the Scout Handbook tells you to do and applies it to the life of a 20-something) says all cultures across human history have had some version of Manliness, and that the mean of all them is your best bet for defining what, by first principles, Manliness can be considered to be. I agree, but I think there is a more succinct way to define what Manliness is for American civilization in the 21st Century, and that entails looking in the mirror at our Western past. 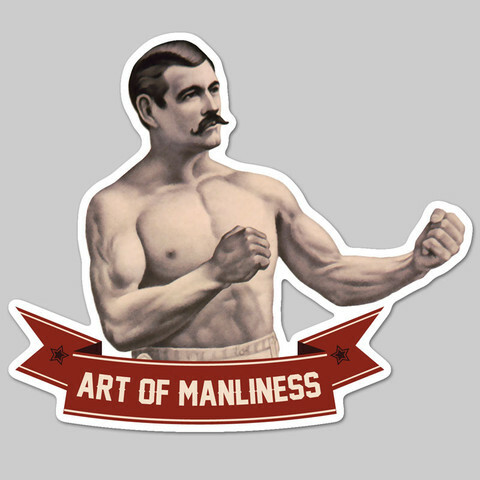 The Art of Manliness’s classic logo- you really need to click that button and check out their site. So, two of the great bards: Homer and Virgil. Homer, the greatest of all oral poets of the war-torn, pre-Hellenic Greece, recounter of the Trojan War, and composer of the Iliad and the Odyssey. Virgil, the first and greatest poet of empire, the conscience of Rome, compiler of the works of the ancients, and author of the Aeneid. I am no classicist, much to my discredit. I have not even read either work I’ll be focusing on (The Odyssey and the Aeneid) more than once apiece. That said, I have read them and read OF them enough that I have a general enough idea of the principles they espouse that I can draw from them certain valuable lessons for our life as a society descended from Greece and Rome. A lot of my ideas here, by the way, are courtesy Professor Timothy B. Shutt at Kenyon College, whose audio lectures about the classic works of literature have been inspirational to me and have formed much of the substance of the ideas behind this piece. Astute readers will notice that I skip the Iliad and go straight to the Odyssey, the second of Homer’s works. Why? The single major character with anything resembling what I call Manliness is Hector, Prince of Troy, and though he is the most honorable of the warriors on the battlefield, he is slain by Achilles and his body is desecrated quite dishonorably. All the rest are basket cases of the worse excesses of human vice and over-masculinity. Agamemnon has foolish, hubristic pride. Paris, seducer of Helen and catalyst of the war, falls to weakness and lust. Priam is the king of Troy and of foolhardiness. 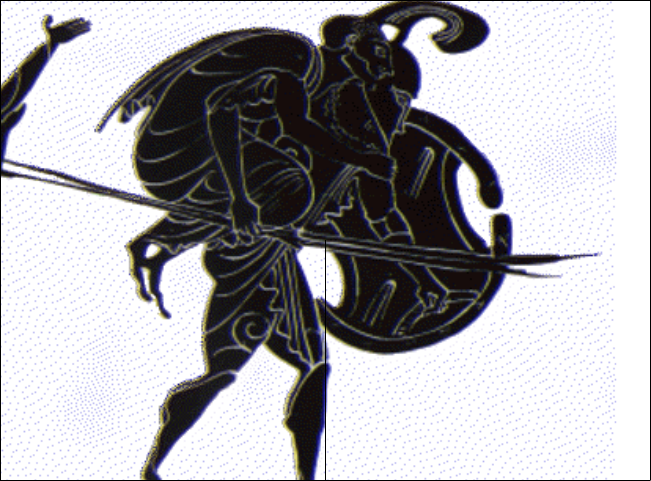 Achilles is the epitome of rash, petty adolescence, godlike though he might be in battle. What is more, these characters are all rich, property-owning males, whose status is based upon their class rather than their character. Not ALL human beings in the Iliad are capable of this chauvinistic virtue of animals; slaves are routinely disparaged, and women are relegated either to servants or sexual conquests (in Helen’s case, literally.) There is no true Manliness here; the first Homeric epic, though beautiful in its prose and timeless in its exposure of truths, provides no (surviving) role model and depicts a world where men are nothing more than speaking animals. Thus I turn to the second Homeric epic, which is often (and plausibly) alleged to have been composed not by Homer himself, but by Homer’s daughter or granddaughter after Homer’s death, using Homer’s recitations of traditional Greek oral poetry as its source. This second epic is the Odyssey. A quick word on the plot- the Odyssey is the story of Odysseus, having returned home from the Trojan War as the lone survivor of his troop, figuring out how to restore order at his home and his kingdom in Ithaca. After Odysseus left Troy, he purportedly got lost and had a series of adventures with such fascinating beings as the Cyclops Polyphemus, the sorceress Circe, the lotus-eaters, the sea-nymph Calypso, the sirens, and the whirlpool Charybdis, in which his entire crew was eaten or otherwise lost. This, however, is but backstory to the true plot of the Odyssey, which focuses on Odysseus using all the tools at his disposal contained with his person- his wit, his cunning, his charismatic leadership, and indeed his physical prowess and endurance- to destroy the hundred-plus young, Achilles-level-maturity suitors who have, in the twenty years of his absence, invaded his home, let his kingdom go to waste, and abused his wife, son, servants, and dog. It is not an easy feat for a single man accompanied by a half-dozen or so loyal servants, but Odysseus does it admirably well. He dispenses justice upon the suitors, saves his wife and servants (with their help,) reclaims his household, and recommences the art of ruling. Homer had a word for the virtue which Odysseus embodies- Arête. Arête had been used in the Iliad, but primarily to describe intense physical prowess. In the Odyssey, Arête means something closer to what we would call excellence– excellence in all traits, physical, mental, emotional, moral. It is expanded from mere animalistic physical prowess to a combination of physical prowess, cunning, creativity, charisma, self-discipline, loyalty to those you love- a marriage of inner and outer excellence, those traits which all Greeks wished to see in themselves and, indeed, which most of us Americans desire to embody if we are to be successful in the social world. Odysseus, the man of twists and turns who could fool any man alive, who could squirm his way out of any tight spot, who could endure the travails of life, who could inspire and lead those he had not seen in decades- this is a man who embodied this different definition of Arête, of excellence in all facets. 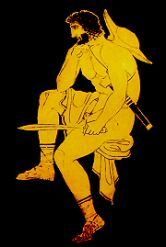 The various adventures Odysseus endured (or enjoyed) were the settings in which his plethora of skills were revealed. Each is revealed in a different time, in a different way; but combined, Odysseus’ talents for deception, inspiration, cunning, prowess, and strategy came to reveal the character of this dangerous man. All these traits and virtues- not merely the sum of them, but the whole which is greater than the sum of its parts- constitute a significant chunk of what I call Manliness. The Odyssey features a great many individuals of these pushed-aside groups displaying traits equal to or greater than those which Odysseus displays. His wife, Penelope, keeps a hundred-plus testosterone-fueled frat boys divided against each other for twenty years, and thus prevents any one of them from threatening their way into marrying her and seizing the household or worse. That is endurance, cool-headedness, and cunning at its finest, displayed BY A WOMAN in the highly-patriarchal society of Ancient Greece. Additionally, note that all those under Penelope’s command- the loyal servants- survive, whereas Odysseus’s entire crew is eaten by monsters. Comparison of leadership abilities much? Various servants of Odysseus, from Eumaeus the shepherd to Eurycleia, nurse of Odysseus in his infancy, to Philoetius the cowherd, are of immeasurably greater character than the hundred-plus well-born, aristocratic suitors. Moreover, their born artificial lowliness does not make them any less capable thinkers and fighters than the suitors, as the Odyssey’s final battle scene demonstrates. This is a breaking down of the barriers of class (and presumably race, as many Greek servants were foreigners) to possessing Arête. Indeed, it could be said that in pitting the servants against the suitors, Homer placed the TRUE nobility of heart and excellence of skill in those of lower birth and station. Thus is Arête- and what I call Manliness- truly open to all those virtuous and determined enough to achieve it, regardless of their background. But there is yet ANOTHER dimension which the composer of the Odyssey expands the definition of Arête into. The Arête of the Iliad is primarily focused with excellence in one’s self, and to a limited degree with excellence among one’s peers. But the Odyssey, in depicting those individuals whom do NOT possess Arête, goes a step further- not only are they not excellent in themselves and not only are they not excellent among their peers, but they are certainly not excellent in society. They violate what the Greeks would call nomos– sometimes translated as ‘the way things ought to be,’ but in my opinion best described as ‘natural law.’ There is a fundamental order of things which you do not trespass against, and part of Arête is aligning yourself with it; if you oppose it, you are a worthless piece of meat. The servants and Penelope, in being loyal to their master/husband even though he is gone, display Arête and respect for nomos in this regard. Meanwhile, the suitors, in disregarding Odysseus’s kingship and his estate, in mistreating his wife and servants and son and dog, in ransacking Odysseus’s household and treating themselves like honored guests while treating those who visit them and counsel them to prudence quite poorly, go against nomos- very far against nomos, indeed. Thus Odysseus’s slaughtering all of them at the end is not merely a display of Achillic fury, of a man righteously reclaiming what is his, but further, an instance of poetic justice against those who would usurp the natural order of things and place their own desires above that which is right, just, and desirable in the world. You cannot be good without being good to others, and good in society. This respect for an unchanging moral order, for natural law, for nomos, is a critical part of Arête, and for the Manliness which I describe. Finally, the author of the Odyssey identifies Arête with something fundamental to the concept of Manliness which the Iliad either did not mention or did not need: constant trials and tribulations, constant struggle as the force which brings out the character of a man in his darkest moments and determines what he really is. While the intrigue and little war which Odysseus finds upon his homecoming are indeed sufficient to understand the necessity of struggle in the development of character, a far more colorful series of episodes more beautifully depicts that quest- Odysseus’s wanderings in the Mediterranean and his encounters with various monsters and mythical beings. I have already alluded to Odysseus being a terrible leader given that all his men end up dead, but there is still moral allegory to be found in his various adventures. In Odysseus encountering the Lotus-Eaters and forbidding his men from eating the hallucinogenic plant, one learns that hedonistic self-indulgement and pleasure-seeking is inherently destructive to one’s effectiveness as a person, one’s autonomous will, and indeed one’s character. 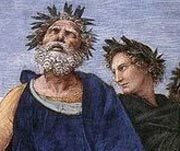 In witnessing Odysseus’s disastrous decision to wait and see the Cyclops of the cave, which results in the culinary deaths of several of his men, one remembers that a leader cannot be reckless and overconfident. In Odysseus’s evasion of the sirens, bardesses of beautiful song, one realizes that beautiful words and praises can be dangerously seductive- especially if they praise oneself. We must avoid the temptation of listening seriously. In the encounter with Circe and the transformation of all Odysseus’ men into pigs and wolves, one remembers how easy it is to submit to the wolfish and piggish instincts within us, and how important it is to maintain self-discipline against these lower angels of our nature. Finally, the navigation between the monster Scylla and the maelstrom Charybdis remind us of the inherent dilemmas we must pass through in life, and the necessity of moderation between extremes, while Odysseus hanging onto a tree branch for hours on end to avoid being drowned in the whirlpool reminds us how critical it is that we hold on through the hardest moments, for relief will come and we will be glad. Indeed, it would seem that Odysseus’s struggles and adventures tell us that we must not only bear through physical dangers- critical though that is- but that we must bear through internal struggles, too, if we are to become the best possible versions of ourselves. This is Arête. This is Manliness. I now turn to the Aeneid, which has been read, often, as a critique of and answer to the deficiencies of Homer’s works. I would argue that it is not so much an answer to the Odyssey, however, as much as it is an answer to the Iliad. But first, a word on the plot- the Aeneid is the story of Aeneas, the greatest of the surviving Trojans, and his leadership of the Trojan people as they recover from the sack of Troy, meander across the Mediterranean world, settle in Italy and wage yet another bloody war, and ultimately lay the foundations of another, greater civilization from the ashes of Troy, which will someday bring order to the world- Rome. The first half recounts the Trojans’ wanderings, with particular focus paid to the actual escape from Troy, Aeneas’s dramatic affair with Queen Dido of Carthage, and Aeneas’s journey to the underworld. After the Trojan Odyssey, the second half of the work represents a second Trojan Iliad- a brutal struggle with the Italian locals, the Latins, for dominance over the land that will one day become Rome. In the end, Aeneas emerges victorious through his sheer devotion to duty and his intrepid leadership and fortitude in the face of a thousand obstacles to his mission as Prince of Troy. The first thing one immediately realizes about Aeneas is his dedication, his devotion, and his subverting his own personality and happiness for the personality and lifestyle he must practice in order to be an effective leader. Aeneas is no Stoic for the sake of it, but in his actions- burying his fear during the storm and encouraging his fellow Trojans not to give up hope, counseling them that one day they may look back with pride upon these trials- he certainly doesn’t let his feelings get in the way of his duty. This is but the most obvious instance of self-denial for the benefit of the group. Perhaps more compelling is Aeneas’s abandonment of Dido, whom he loved deeply, who was in many ways his mirror and the perfect wife for a great man, in favor of his mission and duty to his people. He put his personal life second and his various duties- his duty to the gods, to the Trojan people, to his unique mission- first. The virtue of putting aside one’s aspirations for the sake of duty was called, by the Romans, Pietas, and as Odysseus is the embodiment of Arête, so is Aeneas the embodiment of Pietas. By the logic of Pietas, one’s rights come unquestionably second to one’s duty. It is not merely being good and treating others right, though without that foundation duty would appear to be obscene self-righteousness. Pietas requires active self-sacrifice and devotion to causes greater than self. As we will see, the specific causes which Aeneas is so dedicated to include not only the causes of classic patriotism and leadership, but the very foundation of Rome’s greatness- the causes of Order and Civilization. Integral to Pietas is a pragmatic realism, a respect for practicality of means as the path to accomplishing the objectives one sacrifices oneself for. As Pietas is itself a very idealistic goal, humans being generally self-interested, it is crucial that the means of duty are far more practicable than overtures to duty themselves. So the action requirements of Pietas form a sort of military ethic, a team-based system focused on forging disparate individuals into a coherent and disciplined broader force capable of accomplishing great things. Individuality is not the hallmark here- the hallmark is loyalty to the created group of a form that transcends mere tribalism. Self-control and discipline of the turbulent passions of the mind and heart; determination and endurance through innumerable challenges; patience through episodes of boredom and routine; cooperation with one’s fellows and the abandonment of personal glory for the sake of the mission; competence and skills necessary to achieve any goal that might arise; these are the soldierly qualities associated with Pietas, and Aeneas and his men display them time and again throughout the epic. The travails of the sea-voyage to Italy demand of the Trojans a persistence and fortitude that would grind down the souls of those less patient. And the Trojan and Roman style of warfare demands not the regard for single combat and heroism so highly regarded by Ajax, Achilles, and the other Greeks, but a commitment to formation, maneuver, and command which the Trojans display aptly in their battles with the Latins. Most telling of all is the admonition of Anchises, Aeneas’s father, in the underworld, more on which later: Anchises describes the individualistic artistic and scientific accomplishments of the Greeks, and juxtaposes them with the commitments to the practical pursuits of engineering, law, warfare, and politics, which shall be the lot of Rome to master. Thus abstract commitment to duty is wedded to a concrete commitment to excellence and teamwork- this is integral to Pietas. All this focus on how individuals and groups should define themselves and how they should act underscores the broader vision Virgil sees and Aeneas represents- the commitment to Order and Civilization inherent in those guardians who would give their lives to the cause. But with order comes a price- the sacrifice of those who give their lives to maintain it, and the guilt that comes with the amoral nature of power. And moreover, that order will never be more than a partial accomplishment, for human things decay, and the forces of chaos and dissolution ever beckon at the doorstep. But that order, however temporary, costly, and morally dubious, is worth it. Thus is justified the perpetual quest for order. This rather dark worldview is expressed all across the Aeneid. As for the price of order, one need only look at the death toll on the Trojans’ side during the Latin War, and the grisly deaths which so many brave Trojans met in the defense of an idea and loyalty to their countrymen. Blood greases the machinery of the state and the nation. It is a bit harder to find evidence for the moral dubiousness of empire and order, but it is there all right. The Trojans stake out their new home on the land of the Latins- a noble people, in no way barbaric, in any circumstance a people with whom the Trojans would have amicable relations. But they inhabit the land the gods have set aside for Rome, and though many Trojans recoil at the injustice, they accept the mission and the guilt that invariably comes with it. The most obvious sign of this crude amorality comes in Aeneas’s slaying of Turnus, king of the Latins- and Turnus is a an otherwise noble man, a good king for his people, and someone whom Aeneas would otherwise certainly respect had he not waged war with him. Perhaps more saliently, the founding of Rome requires a break with the Carthaginians, a friendly and amicable people who gave the Trojans more true hospitality than any other Mediterranean people. But in the subsequent rivalry and wars, Rome becomes the great power it is- and it could not become that power were it not for the Punic Wars with Carthage. Every Roman who possesses Pietas assumes upon themselves a certain guilt for the injustice that power assumes. But most detrimental of all to the prospect of order is the fact that, despite the sacrifice it requires, and despite the guilt it brings, it is never a permanent state. Virgil describes it as a ‘false dream;’ Anchises, after admonishing Aeneas of the mission of Rome, sends his son out of the underworld past the Gate of Ivory- the Gate of false dreams. Interpreted rightly, this does not imply that Rome’s quest for order is fallacious or impossible; it does, however, imply that a quest for an immortal order would indeed be impossible. There can be no permanent achievements, and for the huge price of order, its longevity will always be in question. Don’t get comfortable, kids. Professor Shutt describes this more succinctly than I can: “Built into the very structure of things is an unavoidable sadness and loss, and the mortality of things, and inevitable limitedness of things, touches the heart and shapes all that we do and all that we can do.” This Virgilian take on reality brings me to the final lesson of the Aeneid for Manliness. Characteristic of Pietas and Virgil’s mentality is a somewhat fatalistic view of things. Aeneas encounters a fellow Trojan on his voyage, who tells him of a spellbound prophetess inhabiting a cave. On leaves she writes nuggets of truth, and when an outsider attempts to enter the sibyl’s cave and access that truth, the leaves are scattered across the floor. The sibyl, for her part, never bothers to re-organize these leaves. Thus it is implied, in this Virgilian worldview, that although there is truth out there and we can access it, we can never know it all- the world is far too confusing and complex for the mind of man to be able to access any more than a fraction of its truths, and thus believers both in total randomness and total rationality are mistaken. Where some would answer “Does the world make sense?” with a concrete yes or no, Virgil would say “sometimes.” And it is this doubt in the ability of Man to understand how things are that allows Aeneas the firmness to believe his cause is right, yet the flexibility to cope with the obvious contradictions it entails. Pietas, then, is not about a rationalistic observance of certain laws and codes in order to live virtuously, nor is it about a Nietzschean faith in the greatness of the individual following their own will. It is instead founded upon a greater uncertainty in human understanding yet faith in the human spirit, ultimately seeking the best political outcomes by means of the noblest personal strivings. Here Virgil is unparalleled. Aeneas is in all ways exemplary of Pietas. He lives Manliness. I hope my above summaries are neither too inaccurate nor too obfuscatory to be useful to the reader. I contend, still, that to understand what Manliness truly is to an American in the 21st Century, one must have at the very least a basic understanding of the virtues of Odysseus and Aeneas- the individual excellence and regard for good living that is Arête, the dedication to duty and tragic optimism that is Pietas. From Odysseus we gain our respect for competition, for personal greatness, for cleverness and endurance, for adaptability and balance. From Aeneas we learn reverence for duty and service, the value of fortitude and teamwork, and a fuller view of the tragedy and contradictions inherent to political life, and the sort of mentality necessary to live with them and rise above them. It does not matter whether or not Odysseus and Aeneas ever actually existed (in all likeliness, they didn’t,) and even if they did what is far more important than they were is what they represent to us today in literature. Certain truths about the human condition, certain virtues and ways of living, do not change no matter how much historical circumstance might be transformed with every millennium, ever century, every decade. They have critical value for the way we define ourselves and the way we act. In a sense, though Aeneas and Odysseus might never have had hearts of their own, they live across history and still today in the hearts of all those who identify their virtues and values as those most worth living. National myths and civilizational myths have that effect. So what does that mean for Manliness today? First off, the question of roots. While there is only disgusting posing in nativism and racism, I do believe that a sense of what Manliness means in American society today requires acknowledging the Western roots of this nation. Now, there can be contributions from every other nation and civilization the world over, and indeed I believe those can only be helpful and constructive if used properly. But though there is something the acolytes of Manliness can learn from the histories of every other culture and every other cultural mix, there is nonetheless a certain fundamental origin that had its base among the men of Greece and Rome, that ought not be smothered and cannot be displaced. This doesn’t mean that Manliness for everyone around the world came out of the Mediterranean- it merely means that we cannot possibly think of Manliness in 21st Century America without giving our civilizational roots due respect. Second, Manliness needs to democratize to the point of being available to anyone who so wishes to live the lifestyle. For various historical reasons rooted in the last couple centuries, the gender divide between men and women has been highlighted to a ridiculous degree, prompting all sorts of ridiculous statements on gender from the Phyllis Schlafly’s of the right and the postmodern gender theorists of the left. In reality, we don’t need more pointless non-empirical theorizing on gender roles and gender as a social construction. What we do need is an empowering celebration of individual potential, REGARDLESS of gender; and the Manliness of Homer and Virgil promises just that. Note that Penelope and Dido were in every way the equals of their male counterparts and lovers, exemplifying the virtues in the exact same way to often greater effectiveness. In terms of race, class, religion, and region, I’d say there isn’t really too much getting in the way of people outside the white middle-class majority to be manly. But the narratives about the lower standards and femininity of women are not helpful and are standing in the way of more democratized Manliness, and the radical reactions from the far left and right aren’t helping. Better to take Manliness for what it is and appreciate its applicability for every human being willing to live the lifestyle. Third, there is not enough regard in this society for the philosophical, the liberal, the artistic. The fact that most Americans today probably could not list the exploits of Aeneas or Odysseus or, for that matter, other literary cultural role models, is telling. Batman’s resurgence in the Dark Knight Trilogy is something of a start, but mass media can only partially and imperfectly compensate for the written word. Discussions of principle cannot take place in a society where education does not encourage the cultivation of such principle; that is most definitely something to be worked on. I could go on and on, but there’s one last important point to be made about Manliness. The first line, of course, is testimony to Odysseus’s Arête, while the second to Aeneas’s Pietas. Personal excellence is non-negotiable, as is commitment to a cause higher than self. The two ancient figures better embody those principles probably better most other figures could, and thus serve as better models. They ought to be carried in the heart. Over the course of a long-winded, inaccurate, and poorly organized monologue, I hope I have provided some background on the literary and moral foundations of Manliness as it exists in the Western canon and as it ought to exist in 21st Century America. Apologies to classicists for my inaccuracies, but none to gender theorists for my convictions. More essays on this topic will follow.